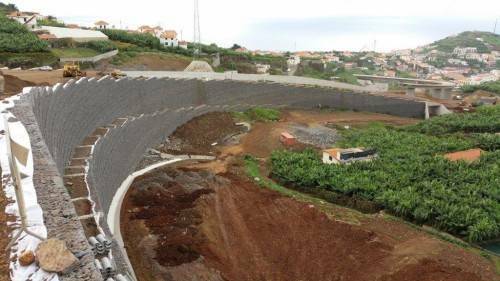 Maccaferri’s Terramesh solutions combine landscape and transportation requirements in Madeira. In order to connect the lower area of Camara de Lobos Strait with the main highway on the island of Madeira, it was necessary to create a new road to facilitate the access of the tourists, avoiding the secondary roads that already demonstrate a very great sign of wear. Due to the island’s altitude and geometry, it was necessary to build a tunnel and a viaduct in order to raise the road from this zone, at sea level, to the quota needed to meet the fast lane. Since the island of Madeira is a renowned touristic area, the integration of the solution in the landscape was crucial. For this reason Maccaferri made several studies, considering mixed geosynthetic solutions. For example, Terramesh system + Green Terramesh in order to meet the project owner’s requirements. Finally, and due to space constraints, the chosen solution was a Terramesh system, which combines verticality with environmental sustainability, allowing Maccaferri to gain ground in the area of the base and prevent further expropriations. This wall would aim to create a platform for connecting the road between the viaduct and the tunnel. It is a symmetrical wall, and in the upper section it is 20 meters high. Due to its great height, a stool 2,5 meters high was built, in order to reduce the visual and safety impact. For the main reinforcements, geogrids – Paralink type, very strong – were used, as well as Macgrid WG in the lower areas. Both Paralink and Macgrid are polyester geogrids, differing only in the coating. Overall were used about 30.000 m2 of Paralink and 50.000 m2 of Macgrid WG, totalling 11.000 m2 of vestment, all realized in one turn. The construction of this wall started in April 2015 with completion expected by the end of the year.